Do you have a clean, emotionally satisfying contemporary romance that celebrates community, family connections and true love? If so—we would love to see it! Submit a cover letter, synopsis and first chapter of your manuscript between April 4 and April 22, 2016, and get editorial feedback from our expert editors! Check out the contest schedule and Announcement blog post for details! Apr 4 9:00 am EST Heartwarming Blitz submissions open! Harlequin Heartwarming wants your book! Learn more about our submission call. Get details on what the Heartwarming editors would love to see in your submission! The #HWBlitz is open for submissions! Harlequin Heartwarming editors will be answering your questions on Twitter today at 2:00 pm EST. Follow the hashtag #HWBlitz. How do you create a high-stakes Heartwarming romance? Get tips from our editors. Hear what published Harlequin Heartwarming authors have to say about the series! 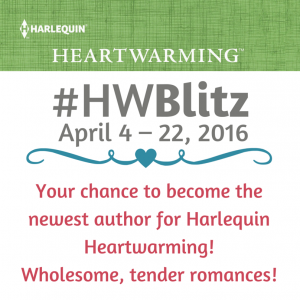 Join us on Harlequin Community any time today and ask your questions about #HWBlitz! Submissions to the #HWBlitz close today at 11:59 pm EST. All of our entrants will receive feedback from our editors.